It was quite an effort to get to Ewood on time for the kick off today. 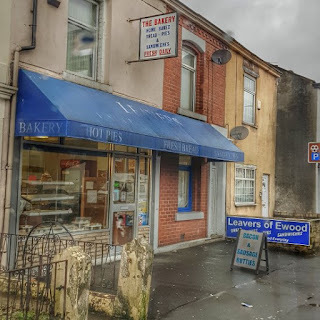 We even rang ahead to put in our order with the peerless Leavers Bakery on Bolton Road, picking up and then wolfing down our motley collection of steak, potato and butter as the whistle blew to start the game against Stoke City in the glorious Lancashire sunshine. "Thanks, love, see you next season," said the lady in Leavers, reminding us that there isn't another Saturday home game. It seems she isn't the only one thinking ahead to August. We certainly are, and with some dread. I also get the impression that's where Tony Mowbray's head is. Those references to 50 points, the talk of a transition, the purchases of players he doesn't use, wrapping them up for a special occasion. To be blunt, come August, the only players who played any part today that I'd be happy seeing start, I mean, really happy in the sense that I'd be gutted if they left, I could count on one hand and in descending order of affection: Darragh Lenihan, Lewis Travis, Ryan Nyambe, Adam Armstrong, and at a push, David Raya. I feel dreadfully disloyal thinking of a team without Charlie Mulgrew and Danny Graham, the absolute bedrocks and saviours of this season, but frankly, something isn't working and they are of an age. Of my favoured five, they have the potential to become top, top footballers at the highest level, they have so much more to give our club. But in a sport dominated by agents, how long before these lads start getting the word that they don't need to be struggling among this dross? Like at Sheffield Wednesday last month, I was most disappointed for Joe Rothwell, who once again huffed and puffed without ever seizing his moment in the absence of Bradley Dack. There's a good player in there that can have an impact, but I just don't think he's a clever player in the way that Dack or Travis is. When a loose ball fell to him early on and he scuffed a clear chance, it betrayed a total lack of confidence. Or that he's just not as good as I hoped he was. I know it's a predictable siren cry for fans to demand they try the kids when other options don't work, and clearly they aren't, but how much might John Buckley and Lewis Travis have enjoyed pitting their wits against Stoke's Joe Allen (the Welsh Xavi) and Bojan (an actual Barca prodigy)? On the whole I didn't think Stoke were much cop, but then seeing us lose to teams that fit that description has been the story of this season. Their young manager clearly has a different idea about what kind of team he wants next term, but they're seeing this one out with a bit more grit. A rare away win seems to prove my fear that all teams lacking confidence need is a game against Blackburn Rovers. Which brings me back to my constant niggle. Once again we seem to adapt tactics to the style of play of the opposition and let them settle in to how they want the game to go. The way Amari Bell slows up play when we have a chance to break is baffling. And if the idea that playing League One quality bruisers in the middle would give us grit, then sadly the manager has a very different view of the abilities and possibilities offered up by Bennett, Evans and Smallwood, and of why Harrison Reed warrants a place on the bench, but not to play any part. My patience snapped today. It snapped with the players I've mentioned just now. It snapped with Mowbray too. It takes some effort for us to get to Ewood, especially as there are other things I need to do on a Saturday to make it all work, both before and after. As I sit here now, it's been a long day. And yes, of course I question whether it's worth it. Because frankly, Blackburn's a long way to go for a pie.